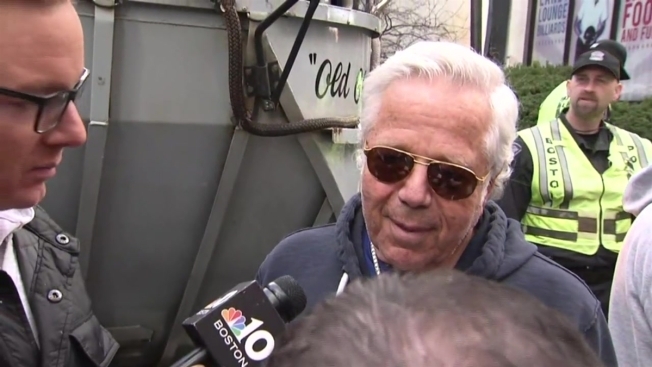 New England Patriots owner Robert Kraft showed off a unique piece of jewelry prior to Tuesday's Super Bowl championship parade — a diamond "Championships" necklace given to him by rapper Meek Mill. Kraft said Meek Mill gave him the necklace at the Patriots' Super Bowl after-party. "Meek Mill gave me that after we won," Kraft said. "(He) has become a friend ever since we played a small part in helping him get out of jail — and where he was unfairly treated in my opinion. He's a great guy and when we were privileged to win the Super Bowl, he took this off his neck and he gave it to me." "These are real," Kraft said of the diamonds. "I actually felt a little guilty. The guys on our team really think it's cool and they like it. "This is a fun celebration. I don't wear jewelry. A couple of my sons are quite ambivalent about it. (But) how many times in life are we going to do this? It might never happen again. We should have a good time and celebrate this. It's a wonderful thing, it brings a community together. We need more of that in today's world." Kraft said this year's team was special in that it didn't have a ton of superstars — only one player was selected for the Pro Bowl — but there was a great connection and camaraderie. "You have something special when you feel connected, and this team has a special connection," he said. Kraft said he is "amazed" that the fans continue to come out for these Super Bowl celebrations. "It's wonderful," he said. "We dream about this. How great are the fans? I saw some guys started lining up at 10:30 last night. Unbelievable. The support they give us is off the charts. "It's wonderful, and you know, we're honored as a family to be here. We're lucky. The real trick in management or anything else is when you have something good, try to keep it going."